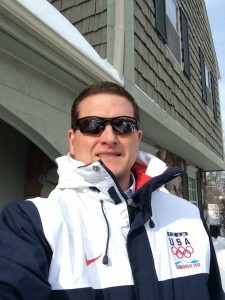 Dr. Bicos is featured as the local Olympic medical commentator in Detroit on NBC TV4! 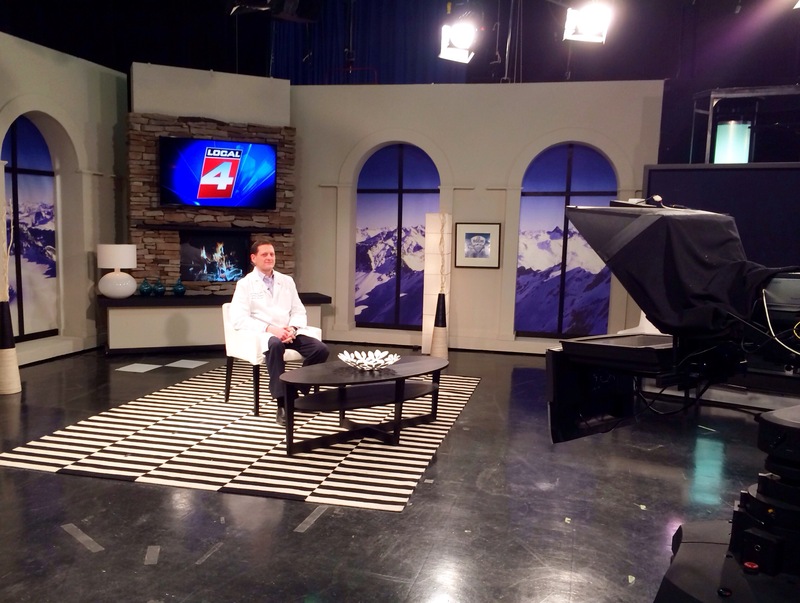 Dr Bicos is seen here during a live interview on NBC TV4 talking about USA’s Jeremy Abbott figure skating injury. So far, the Olympic Games have been more about the sports than the injuries. I don’t mind that at all — that’s the way it should be. Last night, though, we saw two injuries during training at Ski Jumping. 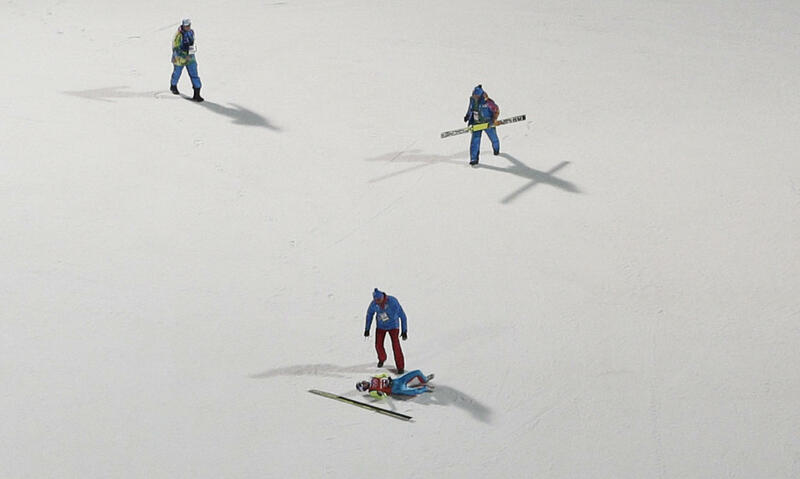 Russia’a Mikhail Maksimochkin crashed on the big ski jumping hill on Wed night during a training session. He suffered multiple rib fractures and was taken to the hospital. At the same training session, Poland’s Kamil Stoch, who took gold on the normal hill, also crashed during landing and suffered an “arm injury”. He left the hill with his arm in a sling. There are two hills in ski jumping. The normal hill, which is 90m in height, and the big hill, which is 120m in height. The ski jumper “falls” nearly 40 stories from the starting position to the landing area in about 9 seconds. The typical take off speed is 55 mph and they land at about 45 mph, all while navigating the air with nothing but themselves, their skis, and their helmet. Rib fractures are extremely painful because they move with each breath we take. So it is very difficult to get comfortable and breath normally, let alone compete in an Olympic sport such as ski jumping. Members of the national ski jumping federation visited Maksimochkin in the hospital to discuss his injuries and his competition plan. So far there is no word on what his return to competition will be. This is where these Olympic athletes throw caution to the wind for the opportunity to compete and win a gold that comes only once every four years! Poland’s ski jumper Stoch does plan to compete further in the event. The finals for the big hill ski jump are being held on Saturday night. Let’s all hope for the best. Keeping you in the game…Whatever your game may be. 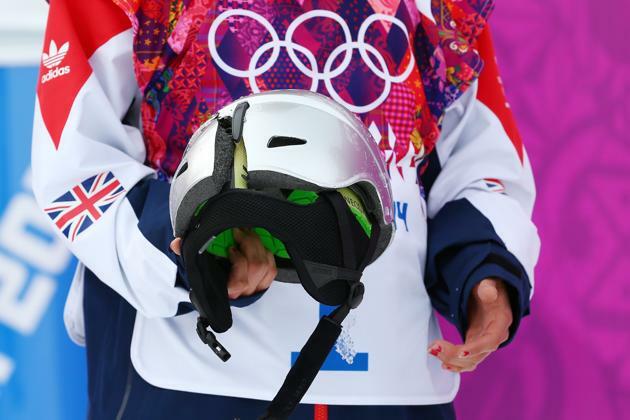 Snowboarder’s helmet probably saved her life at Sochi Olympics! Still think that helmets don’t matter for skiing or snowboarding? Just ask Czech snowboarder Sarka Pancochova, who took a nasty fall during the inaugural women’s slope style snowboarding competition on Feb 9th, 2014. Sarka Pancochova missed a landing during the competition and landed on her back. She tumbled to the bottom of the hill where she lay motionless for a couple of minutes. She was attended to by the medical staff who found that she cracked her helmet in half! Czech snowboarder Sarka Pancochova cracked her helmet during the women’s slope style competition on Feb 9th, 2014. She was able to board down the hill, but was visibly shaken up, as could be seen by the cameras. There were speculations as to an injury, but there is no doubt in my mind that she suffered a concussion. Helmet use during skiing or snowboarding has luckily risen dramatically over the past 10 years. Seventy percent of all current skiers or snowboarders in the United States wear helmets now. Helmet use came to full light earlier this year when racing legend Michael Schumacher suffered a traumatic brain injury when he fell and hit his head on a rock while skiing at a resort in Meribel, France. He WAS wearing a helmet. In fact, the National Ski Areas Association have published data, that although helmet use is up, it has not correlated with a decrease rate of injuries. Many reasons have been stated as to why the injuries keep on rising despite the increased helmet use. The main one is that skiers and snowboarders are doing more difficult maneuvers than ever before that increases the overall risk of the sport dramatically, despite the use of helmets. In addition, the increase in back country skiing or boarding has also increased the risk of the sport. As for Michael Schumacher, even though he suffered a traumatic brain injury while wearing a helmet, he would have died if not wearing one. In my opinion, Sarka Pancochova’s helmet also saved her life in Sochi! The take home point? Wear your helmet while skiing or snowboarding! Helmets can prevent injuries. They keep your head nice and warm while you are outside and even come with built in wireless speakers so you can carve up the course in style!! Performance Orthopedics — Keeping You In The Game, Whatever Your Game May Be!! Dr. Bicos is Olympic Specialist for TV4!! 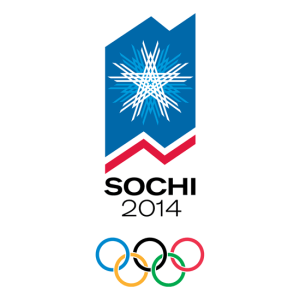 Dr. Bicos was asked by TV4 to be their Olympic Specialist during the 2014 Olympic Games!! Follow along with Dr. Bicos on WDIV Channel 4 for the latest news from the Games. Dr Bicos braves the cold in Michigan.